Dulhan Vol-8 Catalog : Beautiful 6 Embroidery Designer Salwar Suit By Deepsy Suits . Latest Wholesale Salwar Suit Deepsy Suits Dulhan Vol-8 Full And Single Suit Catalog By Deepsy Suits At Wholesale Price Surat. Kaseesh Sharara Catalog : Beautiful 6 Embroidery Designer Salwar Suit By Vinay Fashion . 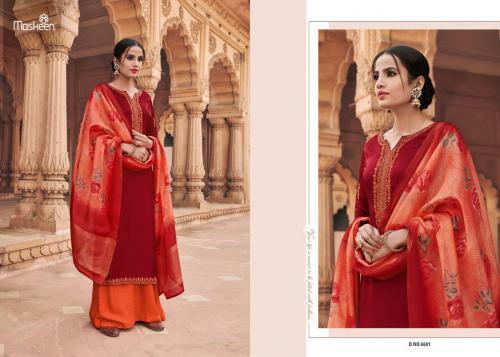 Latest Wholesale Salwar Suit Vinay Fashion Kaseesh Sharara Full And Single Suit Catalog By Vinay Fashion At Wholesale Price Surat. Mrigni Vol-4 Catalog : Beautiful 6 Embroidery Designer Salwar Suit By Utsav Suits . Latest Wholesale Salwar Suit Utsav Suits Mrigni Vol-4 Full And Single Suit Catalog By Utsav Suits At Wholesale Price Surat. Jannat Royal Catalog : Beautiful 6 Embroidery Designer Salwar Suit By Kilruba . Latest Wholesale Salwar Suit Kilruba Jannat Royal Full And Single Suit Catalog By Kilruba At Wholesale Price Surat. Luxury Art Catalog : Beautiful 6 Embroidery Designer Salwar Suit By Kilruba Jannat . Latest Wholesale Salwar Suit Kilruba Jannat Luxury Art Full And Single Suit Catalog By Kilruba Jannat At Wholesale Price Surat. Alankar Vol-4 Catalog : Beautiful 6 Embroidery Designer Salwar Suit By Kessi Kalarang . Latest Wholesale Salwar Suit Kessi Kalarang Alankar Vol-4 Full And Single Suit Catalog By Kessi Kalarang At Wholesale Price Surat. Gujarish Vol-2 Catalog : Beautiful 6 Embroidery Designer Salwar Suit By Ashsee . Latest Wholesale Salwar Suit Ashsee Gujarish Vol-2 Full And Single Suit Catalog By Ashsee At Wholesale Price Surat. Ghunghat Vol-2 Catalog : Beautiful 6 Embroidery Designer Salwar Suit By Your Choice . Latest Wholesale Salwar Suit Your Choice Ghunghat Vol-2 Full And Single Suit Catalog By Your Choice At Wholesale Price Surat. Sana Safinaz Gold Collection Catalog : Beautiful 6 Embroidery Designer Salwar Suit By Shree Fabs . Latest Wholesale Salwar Suit Shree Fabs Sana Safinaz Gold Collection Full And Single Suit Catalog By Shree Fabs At Wholesale Price Surat. Miraya Catalog : Beautiful 6 Embroidery Designer Salwar Suit By Rvee Gold . Latest Wholesale Salwar Suit Rvee Gold Miraya Full And Single Suit Catalog By Rvee Gold At Wholesale Price Surat. Glossilk Catalog : Beautiful 6 Embroidery Designer Salwar Suit By Glossy . Latest Wholesale Salwar Suit Glossy Glossilk Full And Single Suit Catalog By Glossy At Wholesale Price Surat. Elan Silk Vol-4 Catalog : Beautiful 6 Embroidery Designer Salwar Suit By Deepsy Suits . Latest Wholesale Salwar Suit Deepsy Suits Elan Silk Vol-4 Full And Single Suit Catalog By Deepsy Suits At Wholesale Price Surat. Gulkand Maria Catalog : Beautiful 6 Embroidery Designer Salwar Suit By Aashirwad Creation . Latest Wholesale Salwar Suit Aashirwad Creation Gulkand Maria Full And Single Suit Catalog By Aashirwad Creation At Wholesale Price Surat. Tanisha Catalog : Beautiful 6 Embroidery Designer Salwar Suit By Deepsy Suits . Latest Wholesale Salwar Suit Deepsy Suits Tanisha Full And Single Suit Catalog By Deepsy Suits At Wholesale Price Surat. Glamour Vol-58 Catalog : Beautiful 4 Embroidery Designer Salwar Suit By Mohini Fashion . Latest Wholesale Salwar Suit Mohini Fashion Glamour Vol-58 Full And Single Suit Catalog By Mohini Fashion At Wholesale Price Surat. Maskeen Silk Vol-3 Catalog : Beautiful 4 Embroidery Designer Salwar Suit By Maisha . Latest Wholesale Salwar Suit Maisha Maskeen Silk Vol-3 Full And Single Suit Catalog By Maisha At Wholesale Price Surat. Asopalav Vol-6 Catalog : Beautiful 4 Embroidery Designer Salwar Suit By Kessi Fabric . Latest Wholesale Salwar Suit Kessi Fabric Asopalav Vol-6 Full And Single Suit Catalog By Kessi Fabric At Wholesale Price Surat. Aanaya Catalog : Beautiful 4 Embroidery Designer Salwar Suit By Twisha . Latest Wholesale Salwar Suit Twisha Aanaya Full And Single Suit Catalog By Twisha At Wholesale Price Surat. Naam Shabana Catalog : Beautiful 4 Embroidery Designer Salwar Suit By Glossy Simar . Latest Wholesale Salwar Suit Glossy Simar Naam Shabana Full And Single Suit Catalog By Glossy Simar At Wholesale Price Surat.